LMA Recipes – Lunch Time! This class will teach you to needle felt using fiber as paint. Bring a picture of your favorite animal (dog, cat, alpaca, etc) and we will learn to paint the picture onto a pre-felted surface. We will also cover 3 dimensional aspects. A short class covering drawing, design and layout techniques is available for an additional fee on the Friday prior to this class. The Friday class will begin at 1: 00 p.m. and last until 4:00 pm and is $30 per person. All materials included. **It is recommended that students have prior experience with needle felting. The drawing and layout ‘prep’ class is highly recommended if you have any doubts on how to layout or transfer your design. This is a perfect class for folks that have some experience painting but would like to try something new…trust me you will become addictied to the soft fibers and no mess! Holly is the owner of Lasso the Moon Alpaca Farm, Lardworks Studio Inc and Laces of Lore Fiber Art. Holly has been teaching fiber art on the farm for over 14 years. Class Fee: $99 includes all materials and a Farm to table style lunch. A $25 deposit is required to register. If for any reason I have to cancel the class, you may use the deposit on another class, or we will reimburse you the deposit. A minimum of four (4) students is required to host this class. Schedule a private class for a group: If you have four students that wish to take this class, we can work out a date that works for all of us and schedule a private class. To register or find out more information about this class, please fill out the form below. 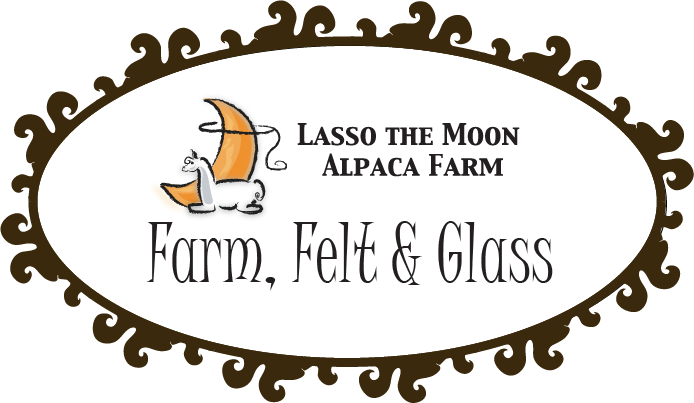 Click here for more information on other fun classes and events at Lasso the Moon Alpaca Farm/ Lardworks Glass & Fiber Studio. Don't work in the garden….PLAY!